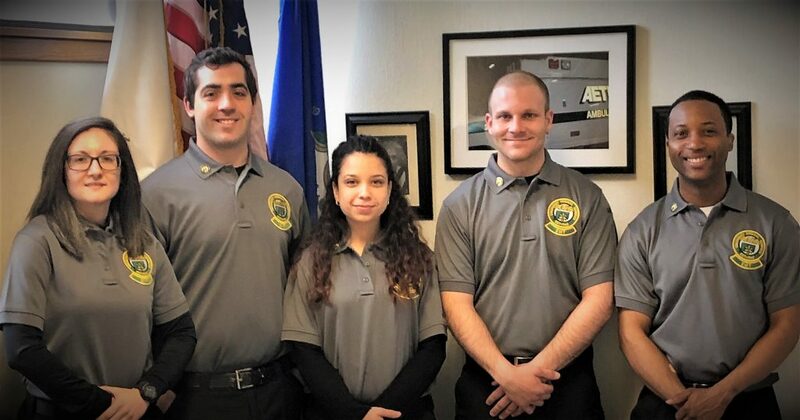 HARTFORD — On April 1st, 2019, two Paramedics and three EMTs and were added to the Aetna team. As part of our continued growth, Aetna and ASM seek out only the best candidates. We look for employees who are focused on high-quality patient care, are team oriented and conduct themselves in a professional manner. During the orientation, employees learn about company philosophy and goals, quality assurance, and policies and procedures. From left to right, Nicole Valente, Anthony Fazzino, Shelma Morales, Tyler Driscoll, and Frank Duncan. Frank Duncan: FULL TIME, EMT. Hello, I’m Frank Duncan. After graduating from UConn in 2015, I spent a few years working as an Office Paraprofessional at WH Public Schools. I also had a passion for firefighting so I became a volunteer with the Town of Farmington where I gained my EMT-B certification. My goals are to expand my EMS experience while strengthening my skills as an EMT. I hope to attend paramedic school in the future as I work to become a career firefighter. I look forward to joining the Aetna team and I’m very excited for the opportunity ahead! Nicole Valente: FULL TIME, PARAMEDIC. Hi, my name is Nicole. I just turned 30 and was born/raised in the south end of Hartford. I went to high school in Wethersfield and currently reside in Newington. I began my healthcare career as a volunteer EMT in Newington in 2012 and the ER at Windham Hospital as a tech while finishing my bachelor’s degree in Biological Sciences at UConn (2016). I transferred to Hartford Hospital on the Cardiothoracic Surgery/LVAD floor (Bliss 9E) as a PCA in addition to working per diem as an EMT for AMR’s Hartford Division. I recently graduated from the Hartford Hospital (CESI) Paramedic Program. I am considering a future career in medicine as a Physician Assistant. For fun, I love to hike in the White Mountains and am always on a quest to find the hottest cuisine/chili peppers known to man. I am extremely grateful for the opportunity to serve the community I grew up in as a Paramedic. I am honored to join the team at Aetna and to continue my relationship with Hartford Hospital. Shelma Morales: FULLTIME, EMT. I enjoy watching horror movies, listening to music and being outdoors. I love to play sports, especially baseball and volleyball. I was born and raised in Puerto Rico, currently live in New Britain. Lastly, I am a first generation college student and aspire to become a PA in the oncology/hematology specialty. Anthony Fazzino. FULL TIME, PARAMEDIC. I am a proud graduate of Hartford Hospital’s Paramedic Program and excited to begin my career in EMS. I recently moved back to Connecticut after living in Hawaii for 4 years. My goal is to continue my education in order to earn my Bachelor’s degree. Outside of work, I enjoy hiking, traveling, and scuba diving. I look forward to being a part of Aetna Ambulance as I continue to improve as a paramedic. Tyler Driscoll: FULL TIME, EMT. My name is Tyler Driscoll. I am from South Windsor and currently reside in Manchester. 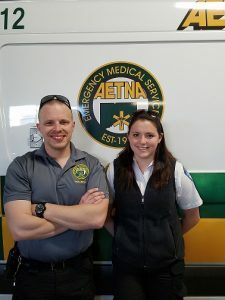 I have been working as an EMT in East Windsor for 5 years now, and I am excited to learn the Aetna ways and grow as an EMT. I look forward to working alongside some of the best providers in the area! Stay safe out there!